Why is this serve receive drill one of my favorites? I refer to this drill as the "meatball" drill. In baseball, a meatball is a slang term for an easy pitch right down the middle of the plate. A meatball is also referred to a fastball that doesn't come in very fast, and is relatively high. This is a ball that hangs out over the plate for the batter to easily make contact with. Everybody batter in baseball wants a meatball. With the ball in this spot, this is right where the batter gets the most power from a swing, as well as allowing for optimal timing of the swing. 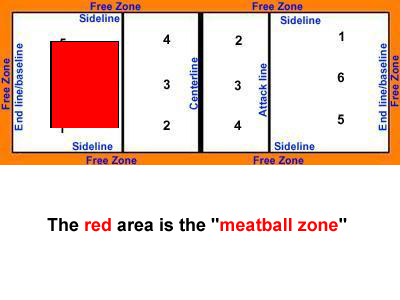 In volleyball, a meatball is basically any ball that's served near the middle and easy to pass. If you place the ball near the sidelines, it will typically be tougher to pass. If you place the ball in the middle of the court, and it's an easy ball to pass, a team will more likely be in system for running an effective offensive play. This serve receive drill is great for teaching passers to anticipate. Also, servers are awarded for mixing up short and deep serves. 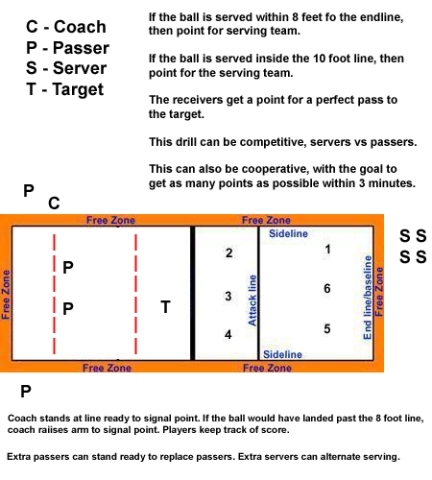 For this drill you need two passers, a server, a target, and person to signal points for deep serves. This drill can be either competitive or cooperative. One variation would be competitive...servers vs passers. Set a time limit, for example, 3 minutes. After 3 minutes, switch servers and passers. Have each team total up their points. The team that has the highest total wins. A cooperative variation would be to set a goal for total number of points scored (total both teams points together). Give a time limit and see if the goal can be reached. Once a goal is reached, raise the goal. Note: This drill is best after passing technique has been taught. For example, if players aren't trained to use good technique to get in position to pass, then they aren't likely ready for this drill. This drill is best for players that already have good passing technique. With this drill, passers can focus on anticipating the serve and working to get in position. This is a great drill because it forces passers to work on front to back and back to front movement patterns. These are the movement patterns most used in volleyball and when players get comfortable moving in this way, passing will be much easier. This drill teaches anticipation. Since the passers don't know whether or not the ball will be served short or deep, the passer must constantly be anticipating the serve. Passers will learn to watch for server tendencies. For example, a server that serves the ball short may consistently contact the ball back behind the head and hit the ball with an upward trajectory. If a passer is able to pick up on this cue, it will be much easier for them to get in position to pass a short serve. This drill teaches aggressive serving. Since the serving team is only awarded points for hitting the serving zones, this teaches the servers to take chances and not just keep the ball in play. Also, a good strategy for winning in this drill is to be deceptive with your serves because you don't want your passers to get points by passing to the target. If you're deceptive, the ball will be harder to pass.